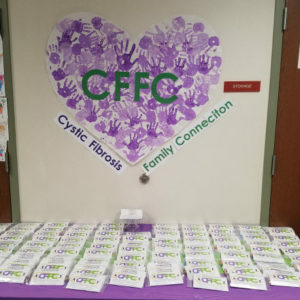 Wednesday, March 20th, was one of those days that fills us with gratitude for the support we get from the extended CF community. 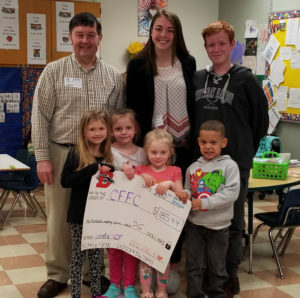 That was the day for the formal presentation of the project conducted for the benefit of CFFC by the Pre-K classes at Dansville Central School. The project was selected by the class as part of the school’s 100 Days celebration (recognizing the first 100 days of school). .
With the help of their teachers, the kids assembled 100 Clinic Baggies for distribution at the pediatric CF clinic at Golisano Children’s Hospital. The standard clinic baggie consists of a parking pass for the Strong Hospital garage, a granola bar and a sunny message from CFFC. 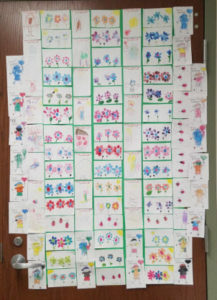 The Dansville kids enhanced the baggies by creating cards to lighten up the anxiety that can be associated with clinic visits. The idea came from teacher Jessica Barber whose son has CF. She has acknowledged the lift they feel when getting the clinic baggie; she appreciates the parking pass while her son enjoys the snack. The assembly process is not difficult; however, this assist from the Pre-K classes provides an appreciated “vacation” from the chore. The icing on the cake was the fund raising associated with the project. The kids contributed spare change and encouraged contributions from others for a total of $185.44. 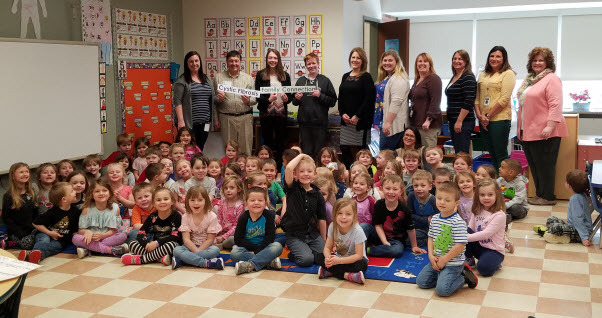 When you receive a Clinic Baggie at your next appointment, say a quiet “thank you” to Jessica, her teaching partners (Brittney Rowe, Chris Spoor and Megan Baumgardner) and all the kids in the Dansville Pre-K classes.